Please take a few minutes to check out my digital scrapbook blog. Ever since I started listening to the Paperclipping Roundtable, I have been inspired to do more with my memories. I have started doing some of what Izzy calls “motion scrapbooking” by making videos about a few of our adventures, and I am dabbling in digital scrapbooking. This page is 100% digital, all of the elements are digital, and the photos are taken directly from the Google Maps street view feature. This is a page about the home where my Dad grew up, I could probably write a book about this house and how it makes me feel and what an impact this home has had on my view of what a home should be. You know what? I could do that! This is digi after all, I could use this page as the cover and write to my heart’s content on as many pages as I like and send it all off to a photobook printer. How cool is that? So the sun was out again today and I was dropping subtle hints to Rusty that we should do something, as a family. He had done about all of the studying that he could stand, so he was just doing some stuff on the computer. Finally, after remembering that I am married to a man after all (and they don’t get subtlety) I came into his room and said, “OK, I am taking the kids to the commissary to get a picnic lunch and we are going to the lake, you can come if you want.” He looked at me and said that he had something better in mind, he showed me the website of an amusement park that is only about an hour away! Once we checked the hours and did the math, we realized that we could get there and get in about four hours of fun (Who needs more? especially with kids). I told the kids that Daddy and I wanted to take them somewhere but it was a surprise, they got dressed and we took off. We got stuck in some traffic, so it took about 20 minutes longer to get there. But we had a great time! Lots of fun was had all around. The only thing that went wrong, I did not charge the camera after my day yesterday! UGH! 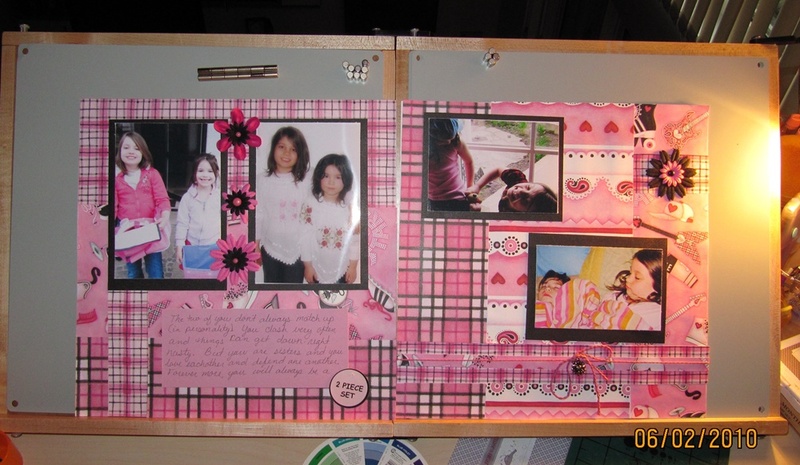 Bad scrapbooker, bad, bad! We took a few pictures with our phones, but my cord that hooks my phone to the computer is missing, so I might as well have not taken any. Oh well, this one will have to live in my mind, alone. After the park we had a lovely meal in the city center of Weiden. We had some wonderful traditional German fair and I got some lovely Spagel, oh yum! Spagel is a rare white asparagus that they have here in Germany, oh, so good! We sat outside and enjoyed the lovely evening and watched people pass us by. As we sat there, our family, surrounded by the sights and sounds of Europe, I thought about how this is just another reason that I love my husband so much! We are so much alike, we love to be spontaneous, we love make our children smile, we love a good meal, and we love to enjoy a beautiful day. I am so blessed to have such an amazing family, I don’t need pictured to remember this day. This one will never fade. Okay, I just discovered this, I about fell over laughing from this one. We FINALLY had some sun this weekend! Oh happy day! Unfortunately, Rusty still has a bunch of schoolwork to do, so I don’t think that he has seen the sun at all. The girls and I joined some friends in Pottenstein for a little shopping, sight-seeing, rolla-bahning, and bungee-trampolining. Then kids had a blast and I got a little sun (maybe a little too much). Last night I, again, re-organized my craft room. I am following Stacy Julian’s Scrap-by-color program and it works very well. I am also experimenting with some other ideas that I have had. 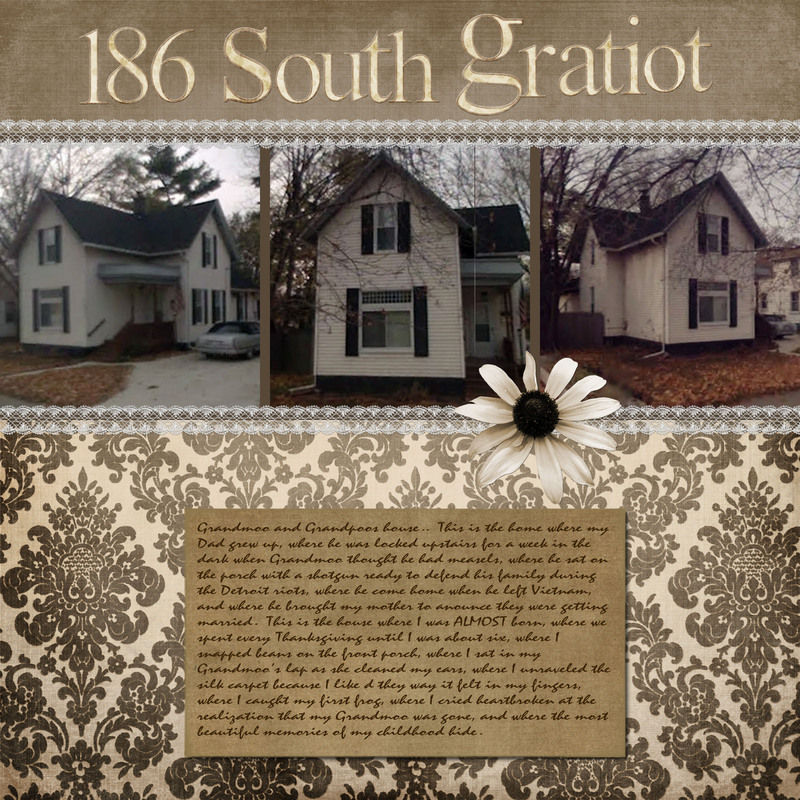 See, I do a little digital scrapbooking, not much, but some. 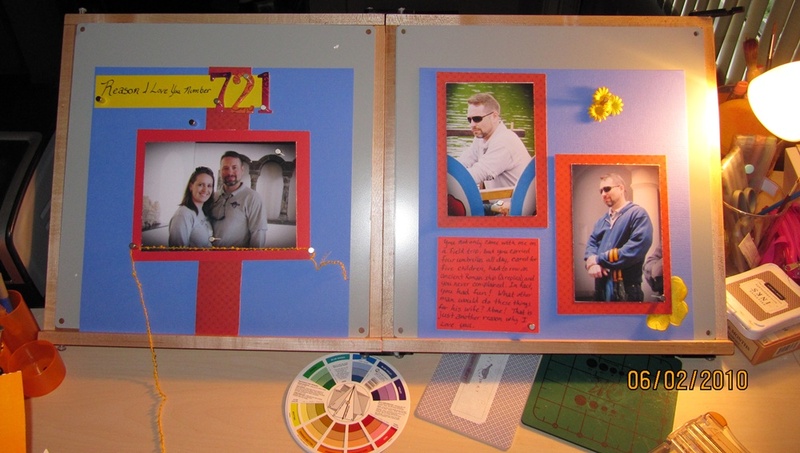 It is great for me to do when I have a bunch of pictures to scrap but not a bunch of inspiring Ideas for pages, but aside from that, I prefer the 3D look (and feel) of my scrapbooks. I do, however, love some of the digital elements and papers available on the internet, digital designers are talented and their kits are gorgeous! Then I thought to myself, uh, self, you have a 12X12 printer, why don’t you print to digi pages and elements you like? Then I answered, self, that is a good idea! See, here in Germany there are no scrapbooking stores to be found and the craft store for Americans is ridiculously expensive (that, or I am just cheap, those of you who know me, know the answer to that one!). I figure if I can print at least 20 pages of patterned paper that I download for a cost of free to no more than $5, then I am actually saving money by using my own printer, and I will have a world’s worth of scrapbook paper available to me at the click of my mouse! Oh yeah! So, enough thinking about it, I decided to try it. I was inspired during our trip to Pottenstein, to do a personality page about Gabrielle. If you know her, you know that she climbs EVERYTHING. I have finally given up making her stop, maybe she will be in the cirque du sole, or something. Anyhow, last year when Debbie came to visit, we went to Pottenstein and Debbie took a great picture of Gabrielle climbing on a stairway railing. Yesterday, in Pottenstein, I took a great picture of Gabrielle climbing a railing for a pathway at the palace. Some things never change. The green and blue patterned paper under the photos and the dark blue strips on the top and bottom are digi-papers printed on my printer. The photo mats and background paper are from my collection. The embellishments were chosen from both my “Green” and “Blue” bins. I love the way this one came out. Also, I must say, that my F.R.E.D. has truly changed the way that I scrapbook, I can really see how my page will look before I glue anything, best gift EVER! I apologize for the glare, I forgot to take the picture before I put it into the book. The journaling is simple, the pic on the left says June 2009, the one on the right says June 2010. The circle on the bottom reads: Both taken in Pottenstein. Some things never change. This morning Rusty and I actually woke up early enough to work out, Yay! We discovered a few unwelcome guests in our bedroom, ants (ugh). I decided to check the girls room, they had another half hour to sleep so I tried to be careful and quiet. There were no ants in their room, but I did find both girls sleeping together in Abby’s bed. Can you say Kodak moment? I ran and got my camera. After I took some pictures and was walking out the door, I came across a tag from an outfit that I had bought for Gabby about a week ago, it said: 2 Piece Set. I tell you what, that scrapbook page just wrote itself! The two of you don’t always match up (in personality). You clash very often and things can get down-right nasty. But you are sisters and you love each other and defend one another. Forever more, you will be a 2 piece set. By the way, I am LOVING my F.R.E.D. Sorry that I didn’t post yesterday, things were a bit crazy. First, it was Tuesday (Double Gymnastics) so it is already our crazy day, but I also had to go grocery shopping. Also, it was unexpectedly cold, so I had to run out and buy a sweat jacket because I was freezing (of course, I had made sure the girls had their jackets yesterday, I was the only one suffering). And finally, when I got home my F.R.E.D. was there! Yay! Needless to say, (after dinner, story time, and bed time) I was too busy playing with my new toy to post. I made a great page about Rusty, the thing that took the longest was the pictures, I have to figure out how to do that without spending way too much time finding, cropping, adjusting and printing my photos. Although, I do love the freedom to find the right picture to go with the story without having to send EVERY picture I take to the processor (I would go broke, I take WAY too many). 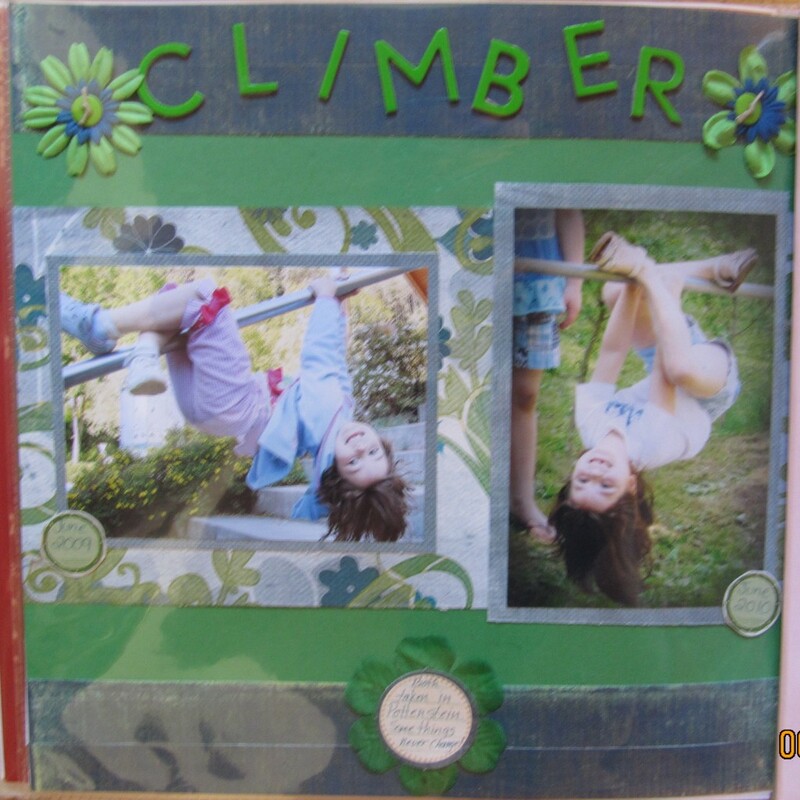 While listening to the most recent Papperclipping Roundtable I was inspired to send them a comment because I was surprised to find that many of the scrappers on the panel create scrapbook pages for the pictures first and decide upon a story later. I am just the opposite, I write in my journal stories of our life, and some of them inspire me to scrapbook. When I am ready to create a page about this story, I search through my pictures to find the ones that fit my story. This is how my daughters (who were so young when my Dad died, and not even born before my mother passed) know who their grandparents are. My parents are the sum of their stories, and these stories are the legacies that will be passed down. I feel that it is my job to be the historian who documents the lives of my family, both of my childhood and my adulthood. 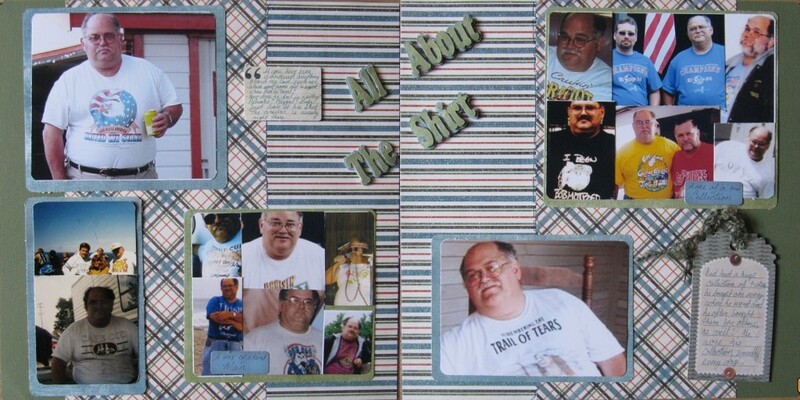 My most recent example of a story that needed to be documented is my Dad’s t-shirt collection. Silly, right? But very important, if my children are to understand my Dad’s goofy side (one of my favorite parts of Dad). -Which sport teams did he support? -How does he feel in a picture? Patriotic? Playful? Goofy? Just look at his shirt! The answer is usually right there. Dad had a huge collection of T-shirts. He bought them everywhere he went and he often bought them for others, as well! He wore his collection proudly every day. This page is a good example of the lighter side of my Dad, and the girls got a laugh out of it, especially the shirt he is wearing in middle left. Those of you who knew Dad, know that this was one of his favorites! I know it has been a really long time since I have updated the blog, but I am back! Inspired by the “Paperclipping Roundtable“, I have decided that this blog is my digital scrapbook, so I need to keep it up! So check in from time to time to see what we are up to. Well, Michelle and I decided to shake things up even more. We’ve been eating healthy for about 2 weeks now. I just had veggie burgers for the 2nd time, and I’ve got to say, I really like them. They’re not greasy, and they taste great. We’ve had some really great food over the past 14 days. We’ve enjoyed everything from sirloin steak to pork loin. I haven’t yet felt hungry either. We’ve been using slimfast.com to get recipes and build shopping lists. It’s free and really easy to use. I eat about every 3 hours, and I have plenty of energy. I’ve limited myself to about 1500 calories a day, but I don’t bother to count them. I just eat the planned snacks. It was hard to do the first few days, but it seems to get easier every day. I just set an alarm on my cellphone for each snack and lunch. It is amazing how much can really happen in one year. We cut up all of our credit cards and started using only cash/debit. We went to Dave Ramsey’s Financial Peace University and decided that we will do whatever we have to do to get out of debt. We both got laser eye surgery. The kids changed schools, Gabrielle changed twice! We got our new home. Rusty has rededicated himself to learning to play the guitar like the pros. I think it’s funny how most people, even me, stress out about change. I will tell you from first hand experience that change is much better and much more fun if you sit back and accept it rather than try to fight it. Change is going to happen, the hardest part is deciding what you will do about it. Hey everyone, I am sorry that we have not been posting recently. We have our house now, it is great! We just got our high speed internet and things are really going well. We have posted our pictures from the Paris trip, take a look! The Goal represents the amount of debt we had when we started our Total Money Makeover in January of 2008! The current temperature is the amount we've paid-off to date! Presented by Luggage, Philadelphia Hotels, Coded: EZwpthemes.